An important part of safe cycling is ensuring that the equipment you use (or that your child uses) is well-suited and in proper working order. We’ve prepared this information to help you check your bike to make sure it’s ready to ride, or to help children with doing the same for theirs. But it’s just a bike! 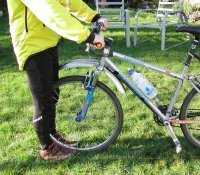 Many people stop cycling (or find it difficult to start) because that work poorly—sloppy or inoperative shifting, poor braking (or missing brake cables) and other factors. Bicycles are vehicles that must work properly, and they must be properly maintained. Investing in, and maintaining, the right bike can lead to a lifetime of healthy and enjoyable cycling. Need assistance with any part of this information in the fact sheet? Feel free to email us with your questions, or ask staff at your local bike shop for tips! This information is available in PDF format. Please feel free to distribute this document as you please, provided that it is reproduced in its entirety—logos and CCE contact information may not be omitted. The materials are © 2010, Center for Cycling Education. To check your bike thoroughly for safety, start at the front of the bike and work back. Not all of these checks will need to be made before each ride, but some checks are necessary for each ride; for the others, it’s important they be checked regularly. Not sure about an item? Ask staff at your local bike shop for tips. Check that both the front and back tires have the right amount of air. Pinch the tire with your thumb and index finger. If you can push it in, it’s too soft for most riding. Check the sidewall of the tire for the proper pressure range. Avoid filling tires at gas stations—their high volume can easily explode a bike tire. If you’re riding on gravel or dirt, you’ll want less air to help with traction and for cushioning your ride. For riding on the road, use higher pressure. The valve stem on each tire should be sticking straight out of the rim. If it’s at an angle, the rim can cut the valve, causing a flat and ruining the tube. Deflate the tire, rotate the tire and tube in the proper direction, then reinflate it. Wheels straight and spokes tight? Spin the wheels (front and back) to make sure they don’t wobble. 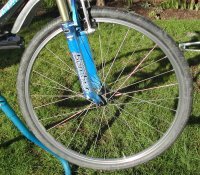 Look at the spokes; replace any broken spokes before riding. Check all spokes for tightness by squeezing together each pair that crosses one another. You’ll need to do this on both sides of the front and back wheel. Recheck any time the wheel takes a hard hit, such as a pothole or curb. Be sure that the axle nuts or ‘quick release’ mechanisms are tight and holding both the front and rear wheel on securely. Quick release levers should be tight and in line with the fork (front) and frame (back). Levers should curve inward, toward the frame or fork. Pull in hard on both brake levers. There should be at least one to two fingers of space between the levers and the handlebar. 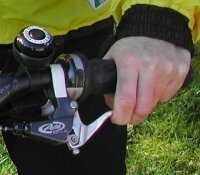 The brake levers should move in at least 1/2 an inch before engaging the brakes fully. This allows for more controlled braking (rather than off/on). 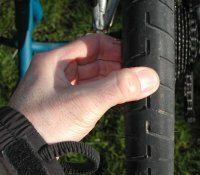 The pads should be in line with the rim (not at an angle), and should not be either hanging off the rim, or rubbing against the tire. If the grooves in the brake pads are worn off, or the pads are thin, they must be replaced (leaving this too long can lead to metal in the pads scraping the rims). This is an important check that few people perform. Facing the front of the bike, hold the front wheel tightly between your knees, and with your feet on either side of the tire. Now try twisting the handlebar from side to side. It might flex a little (especially if you have suspension forks) but it shouldn’t move out of alignment. Make sure the seat can’t twist from side to side, or drop down into the seat tube. Note: Suspension seatposts will always have some movement side to side. The chain should have enough lubricant to allow free movement and prevent rust, but should not be overly lubricated. If it’s dry, put on some lubricant. If it’s dirty or too oily, clean and relubricate it. Be sure to wipe off any excess lubricant with a rag. Cleaning the gears is important, as well (they do not need lubrication). Stand back and look at the bike. Does anything look loose or likely to get in the way of operating the bike? 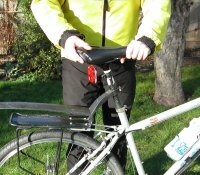 e.g., locks over the handlebars or around the seatpost—these can swing into the spokes or get caught in the brakes. Check the rider for hazards (don’t wear a backpack with the straps undone, or wrap a jacket around the waist). Pick the bike up a few inches and drop it: listen and look for rattles or moving parts that need to be secured. The only part that should move is the ‘derailleur’—the part that takes up the slack in the chain and shifts the gears on the back wheel. Move the shifter on the right side of the handlebar to see this part move side to side, and you’ll have located it. Check tire pressure and brakes, and check the bike and rider for items that might cause a hazard. 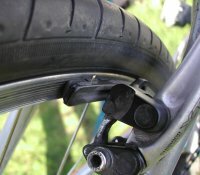 Squeezing the brake levers before getting on the bike keeps the bike stable, and confirms that the brakes are working. Check the quick releases, if your bike has them. Check your bike (and your clothing) visually for anything that might be amiss. 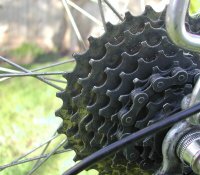 Do the ‘drop test’ with your bike to listen for problems. Regularly check the other items described above. How often depends on the original condition of the bike, how much and in what conditions the bike is ridden. This document is licensed under a Creative Commons Attribution-No Derivative Works 3.0 United States License You may distribute the work, but may not alter it—logos and CCE contact information may not be omitted. Permissions beyond the scope of this license may be available at http://www.thecce.org/copyright-info/.